Although these two events are viewed as the beginning of the expansion of health education and facilities on campus, there are clues that the preparation for their work began a few years earlier. In 1962 a gathering of data about existing facilities used for health science education and research occurred. It is unclear from the documents who gathered the information or to whom it was directed, but they prove to be interesting none the less. 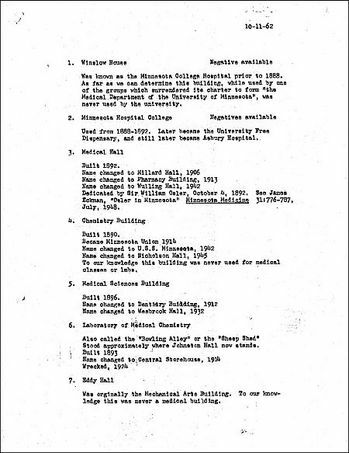 The first document below lists all buildings associated with medical education at the University of Minnesota. The list is divided into two sections; first the “Old Medical Group,” an area on campus situated just south of the Pleasant St. loop and second, the “New Medical Group,” an area south of Washington Ave and still home to a large majority of health sciences facilities. The list also includes building dates and changes to the building names over the years. The second document is based on the information collection in the first; however, this document provides building valuations for each facility. It lists the total construction cost, the amount of state or federal contributions, and any major gift or endowment associated with the building.